April is the month normally associated with lots of rain showers. Even though rain can make us feel gloomy and fed-up at times, one of the wonders created under the right conditions of raindrops and sun are wonderful rainbows – fleeting spectrums of glorious colour that make us stop in our tracks and break out into wide smiles and feel a sense of awe, irrespective of our age. We can even end up giggling like children if we are lucky enough to see a double or triple rainbow. Some people have been lucky enough to see the full circle of colour from an aeroplane whereas on the ground we only get to see a half-circle because of our position. So the position we take can make a big difference to what we see just as we can appreciate April showers or feel fed-up by them. 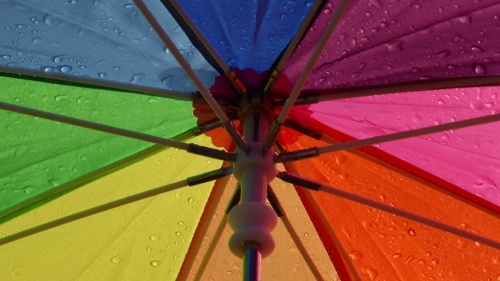 In order to feel better about April showers, it might be helpful to think of April as a time for rainbows and what the research into colour shows. Research points in the direction that colour is used to create moods. So brown may be used to suggest ruggedness such as leather saddles and boots but also to stir appetite such as when seeing melting chocolate. White tends to be associated with clean and crisp because it creates that mood. Red has been associated with being active, stimulating, impulsive and successful. Women are often advised to wear red on dates and at interviews as research has shown that men are particularly attracted to this colour. The right shade of red can be very attention-grabbing and so is a good colour for highlighting features of importance for example. However, a number of studies show that both men and women’s favourite colour is actually blue followed by red. Men and women’s least favourite colour is reported to be orange. The more a colour stands out like a sore thumb (as long as it creates the right mood for that particular situation), it is more likely to be remembered. People recognize and recall an item far better (text or image) when it clearly and obviously sticks out from its surroundings. The way that colour is described also influences us as we perceive and associate names rather than just allow the colour itself to appeal to us. For example people loved mocha but hated brown even though they were shown exactly the same colour. Elaborately named paint colours are also more pleasing to the eye than their simply named counterparts. So a paint called sky blue is going to be far more appealing than light blue. People are more likely to buy items with unusual and unique colour names such as jelly beans called razzamatazz compared to jelly beans names such as lemon yellow. This effect was also found in non-food items such as sweatshirts. What sort of mood do you want to create? For example, excitement, calm, ruggedness, sincere, sophisticated. What is the situation you are dealing with? For example, buying an item, selling an item, deciding on which item you want, creating an ambience, carrying out a task and so on? What are some descriptive colour names you can use to associate the colour with your situation? For example, clean crisp white is unlikely to imply something that is rugged so choose the colour and descriptive name carefully. Does the name of the colour and the colour itself appeal to you much more now? Have you created the mood you want? Can you now find the pot of gold at the end of the rainbow or at least enjoy the rain drops as they pitter patter on your window and enable our grass to grow and our crops to flourish.